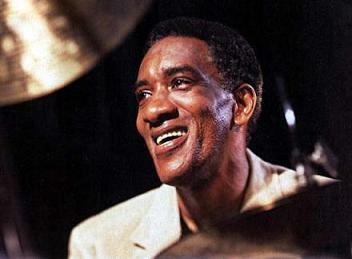 Al Foster is one of the pioneers of Jazz Fusion, born in 1944. He has played with many contemporary jazz musicians. He get noticed by playing with Miles Davis during his electric period, from 1973 (after Tony Williams, Lenny White, Jack DeJohnette and Billy Cobham) until his death in 1991 (including "We Want Miles" ( 1981) with Mino Cinelu on percussion, and which received a Grammy Award). He is a master of the improvised playing of the four limbs in independence, like Jack DeJohnette, Elvin Jones and Tony Williams (they are almost from the same generation) and pushing the traditional jazz drumming (swing) in an almost unsurpassable level. 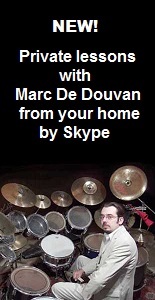 Its very reduced set integrates a Chinese cymbal and his playing is as technique (hits alternating playing, heel/toe with the left foot, etc. ), versatile (he can have as well a very original and fast "funky" playing, as a very square rock, reggae, latin, jazz bebop, swing or "afro" playing) and surprising (a remarkable sense of improvised counterpoint, the mark of the greatest jazz drummers, and a great inventiveness in the use of timbres and sounds which can be taken out from the instrument).